In a time when information is critical to success and budgets are tied to outcomes, the need for strategic employer engagement with colleges has become more important than ever. No longer can programs be developed with limited input from local employers. Staying informed of trends around skill sets, national standards and credentials, both locally and globally as an industry sector, is a requirement that all community and technical colleges must prepare for, implement, and manage. One-on-one outreach to business or advisory committees that meet twice a year and have limited interaction with the college between those meetings are merely the beginning of engagement. The college exists to prepare a workforce ready to serve the community and to prepare students for continuous learning in rapidly changing businesses. Not only are colleges requiring and desiring greater input and engagement, but employers are seeking ways to better engage in order to benefit and prosper from hiring graduates from their local college. 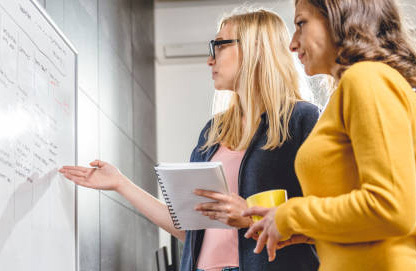 According to a study conducted by Gallup for Inside Higher Ed, 96 percent of chief academic officers claimed to be “extremely or somewhat confident” that their institutions are preparing students for success in the workforce. In contrast, just 11 percent of employer representatives said they believe that graduates have the skills and competencies needed by their businesses. As businesses change and new technologies are introduced the need for skilled workers who meet the new challenges is happening in real time. Improving the linkage between education and business through internships, apprenticeships, and other work-based learning models allows for greater success not only in curriculum alignment but also in graduates being better prepared for the workforce. Programs developed in partnership between education and industry better prepare participants with the relative skills needed to secure a job. The economic development impact of employer engagement should not be underestimated. As local businesses thrive due to increased productivity of their well-trained employees, they are able to expand their operation, and increase overall organizational productivity which leads to a healthy local economy. The case for increased and relevant employer engagement can be clearly stated to local businesses as part of their growth strategy. The key to employer engagement is the relationship between the two organizations. Each relationship is unique based on the industry, level of interest in engagement and hiring needs, size of organization, personnel and personalities. It is often because of this uniqueness that many colleges find it difficult to manage the relationships, keep the engagement at the forefront, and continually seek ways to grow their partnerships with industry. There are challenges on both sides of the relationship including time, use of a common language, speed to process, and more. Being open to discussing and addressing these challenges will set the tone of the partnership and allow for level setting expectations for greater engagement. This framework provides useful tools to assist colleges in identifying new areas for engagement, how to’s for implementing engagement activities, and means for managing the partnerships. Based on our research, observation, and experiences, we will provide employer viewpoints, college best practices, and case studies of successful engagement activities that work. 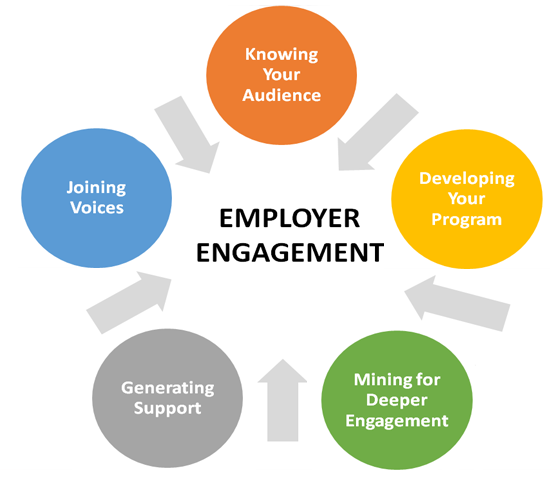 Employer engagement takes many forms and can start gradually and grow organically. However, there is a need for strategic thinking to maximize the value of the engagement. When there is evidence of strong employer engagement in program development, all other areas of employer input will increase. For example, when the college has a strong model of engagement in program development, the following are likely. It is easier to get other employers engaged and to generate new ways to connect them to the program and college. Programs with input from employers lead to increased graduation and graduate placement rates. 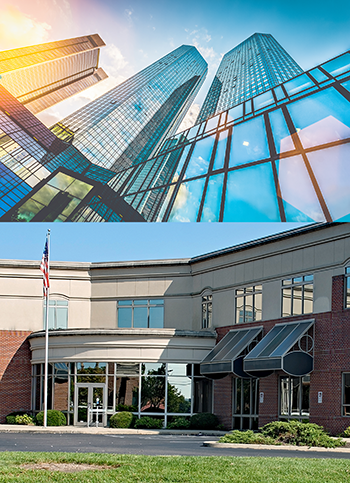 Engaged employers are aware of program and college needs and offer to connect them to their networks and resources or to make donations to benefit the program. Engaged employers have an increased awareness of the real challenges and opportunities which may lead to them lending their name to advocacy, sector leadership, or branding. Click here to provide feedback about the Introduction.